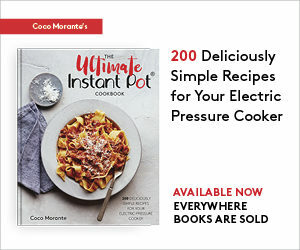 I just love an efficient, easy recipe, don’t you? 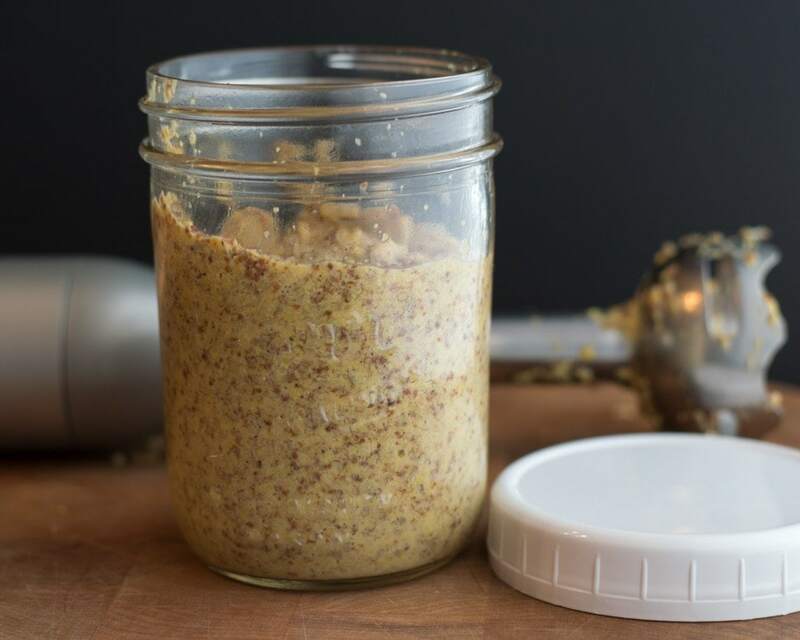 It turns out you can make incredible mustard at home without dirtying any bowls, and with just one spoon and a stick blender to rinse off when you’re done. All mustard recipes can be summarized in three basic steps, which I’ll outline here. 1. Soaking the mustard seeds. The little seeds are hard and won’t easily blend in their dry state, so they need to be hydrated before being processed into a spreadable condiment. Different soaking liquids can be used, depending on the style you’re aiming for. Water will produce a very clean and spicy mustard flavor, beer or wine will add a little body and a background flavor note, vinegar adds acidity and mellows the spiciness factor a bit . . . the variations are endless. Regardless of the liquid you use, the seeds need to be soaked for at least four hours, and up to two days. 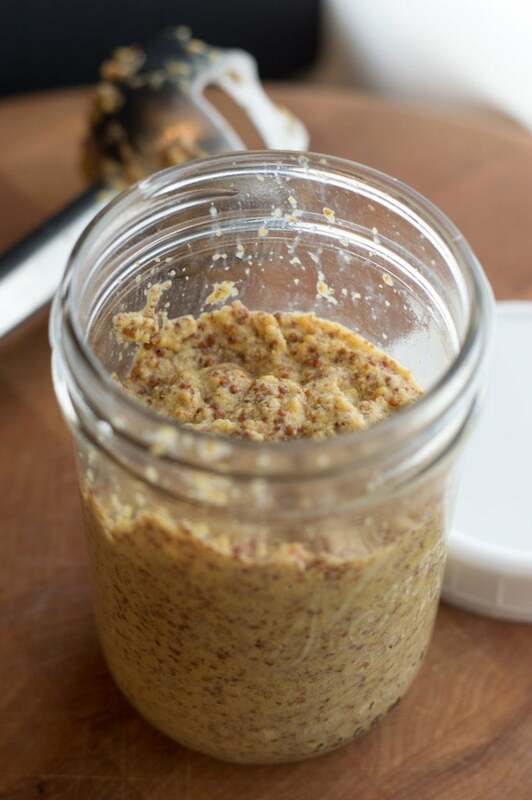 For the recipe at the bottom of this post, I’ve used a mix of champagne vinegar and dry white wine for a medium-spicy, flavorful mustard. 2. Seasoning and blending the mustard. Once the seeds have soaked, it’s time to blend them into mustard. You can do this in the blender or food processor, with a mortar and pestle, or as I’ve chosen to do, with an immersion blender. This method makes the least amount of clean-up, since you’re making the mustard right in the jar in which the seeds have soaked. After you’ve blended the mustard to the texture you prefer, taste it for seasoning, adding more salt if necessary. Oh, and if you like, you can leave out the blending step entirely for a sort of “mustard caviar,” a great condiment in its own right. Just stir in the salt and you’re done. If you like a very hot mustard, you can forego this step. However, if you seek a more mellowed, melded flavor profile, leave it out at room temperature for another day or two. Taste the mustard periodically — when it has mellowed to your liking, store it in the fridge to stop the aging process. It’ll keep for a long, long time (about one year), becoming milder over the course of its shelf life. 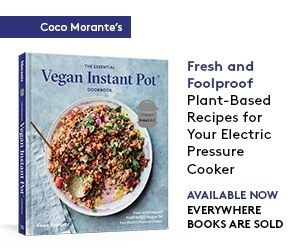 An in-depth article in Mother Earth News, from prolific food writer Barbara Bassett. I always learn something new when I read one of her pieces, and this one is no exception. Wikipedia’s entry on mustard is a great source of information as well. 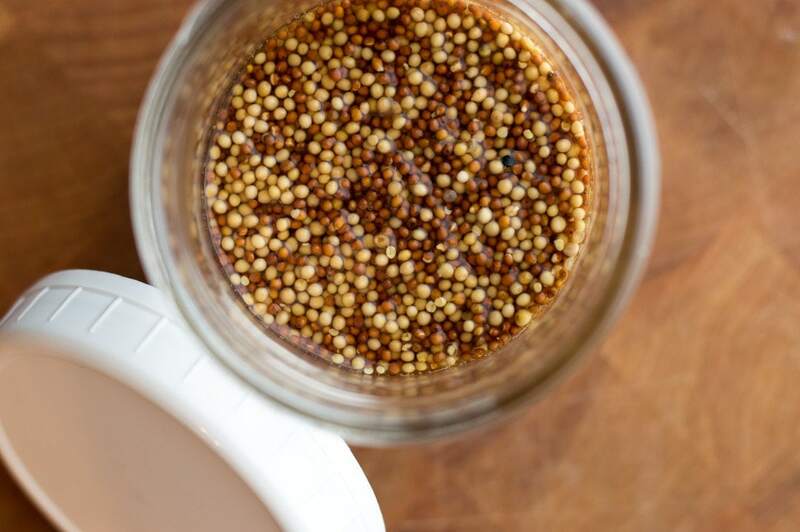 Learn what distinguishes different varieties of mustard seeds and styles of the prepared condiment. The section on mustard in Harold McGee’s On Food and Cooking is another great source of info. Okay. 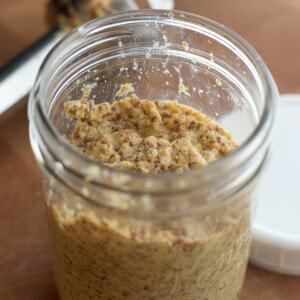 Now that you’re a true mustard expert, it’s time to make a batch of your own! This mustard is packed with Dijon-style flavor. It's coarsely ground for lots of texture, since I just love the occasional pop of a spicy, whole mustard seed. A combination of yellow and brown seeds gives it a well-rounded flavor and moderate spice. In a wide-mouth, half-pint or one-quart Mason jar, combine the vinegar, mustard seeds, and white wine. Cover loosely and leave to soak at room temperature for at least four hours, or up to two days. 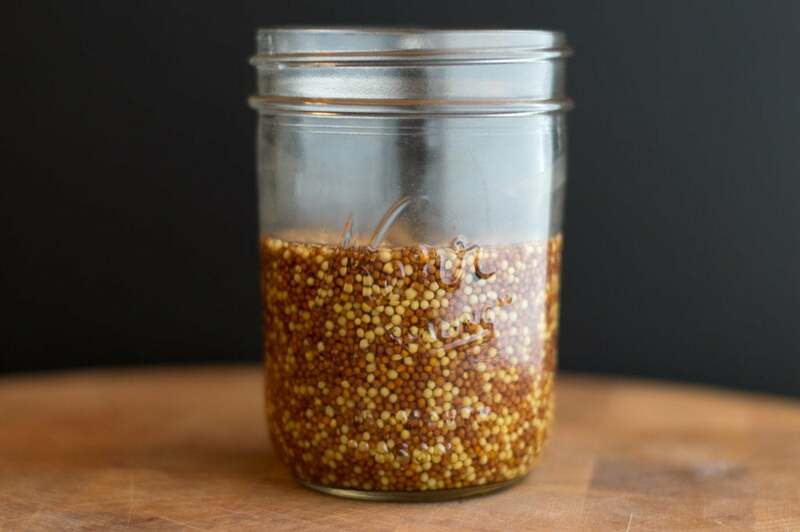 Add the kosher salt to the soaked mustard seeds, then use an immersion blender to process the mixture to your liking, about one minute for a coarsely-ground mustard. Taste the mustard. If it is to your liking, store in the refrigerator. If you prefer a mellower mustard, let it age at room temperature for a day or two, until you are satisfied with the flavor, then store in the refrigerator for up to one year. Cool! I never thought to make my own, how fun! I never thought of making mustard but your recipe looks great and I will try it.